Meeting costs can skyrocket quickly! Even when a business sees the value of a meeting or conference away from the office, there isn’t always an unlimited amount of funds to make it happen. Experienced meeting planners agree that there are a few key areas where spending seems to spiral out of control and that’s where we can help. Here are some ideas on how you can save money but still make your company meetings something special. Ask yourself what is essential to conduct the meeting or conference. Prioritizing what you need and want will help you clarify where to spend and where to save. Higher ticket items typically include the venue, table and chair rentals, food, compensation and travel expenses for speakers, and marketing materials when applicable. One of the best budgeting tactics you can employ is looking for venues that can accommodate the majority of the needs on your prioritized list and offer package rates. Also, always make sure to have a contingency allowance for unexpected expenses. Convenience costs more. When you wait until the last minute, you’ll likely pay more for the convenience of having materials expedited or end up having to rent a space larger than you need at twice the cost. Being organized is key. Anticipating what you need in advance will help you avoid added fees for rushed delivery or setup and hopefully help you avoid unwanted surprises. It doesn’t hurt to ask the venues you are considering if they offer discounted rates during non-peak or off-season periods. If you begin planning early enough, this could be a huge advantage as far as staying on budget. Depending on the region, off-season dates can vary. Typically, winter and early spring months are less busy for many hotels, resorts, and other event venues so they are willing to offer reduced rates or special promotions. If you’ve done your homework, you’ll have a pretty solid idea on how many tables, chairs, and place settings you’ll need as well as additional tables for checking in attendees, housing materials and refreshments, and holding audiovisual equipment. Armed with this information, you can work with the venue coordinator to create an efficient layout or floor plan to eliminate paying for more space or furniture than you need. Regardless of the size or duration of the event, you’ll probably need to provide either light refreshments or a meal. The best bet is to keep it simple. Limit choices available for entrees or better yet, go with a self-serve buffet. If the venue offers catering, meet with their catering manager to discuss your needs. Often times, if you’re renting the venue, they’ll work with you and your budget to ensure they get the contract. Be open and honest about what you want and any budgetary restraints or concerns. Most of all, be flexible. Going digital is a great way to reduce expenses. In this day and age, most people wouldn’t dream of leaving home without an electronic device in which they can read email or download a PDF. Use that to your advantage. Instead of printing out materials, email documents to attendees beforehand. That way, they have the option to print out what they want. That being said, it’s still a good idea to print a small number of copies to have on hand for those individuals that prefer old-fashioned handouts. Using local businesses, vendors, and suppliers will not only cut costs on delivery charges, it will also add a little local flair to the event. If, for example, your venue does not provide catering services, a local restaurant that uses seasonal, fresh ingredients from the region would be a fantastic alternative. Rental companies, audiovisual businesses, printing service providers, and sources for decor and entertainment are a few other resources you could utilize. 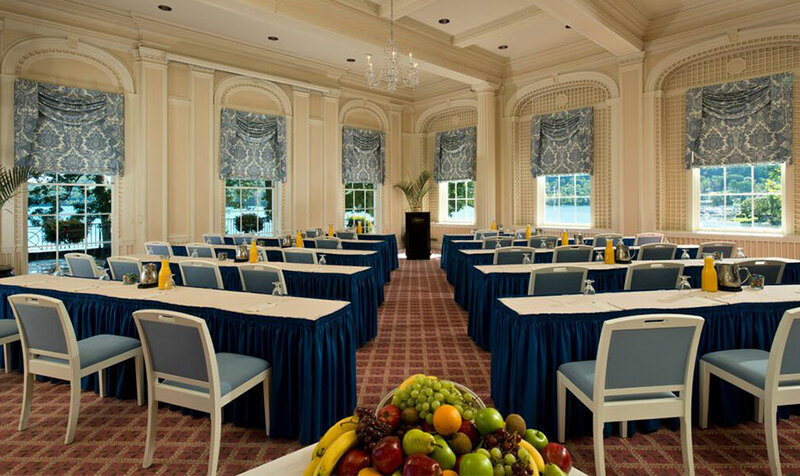 We pride ourselves on making meeting or conference planning a pleasant and budget-friendly experience. The Otesaga Resort Hotel offers more than 30,000 square feet of versatile spaces for events as well as on-site catering, audiovisual equipment, wireless high-speed internet, superior service from our attentive, professional staff, and luxury accommodations.Located in the heart of Cooperstown and set on the serene shores of Lake Otsego, The Otsego Resort Hotel guarantees you’ll get the most bang for your buck when you let us help handle the details of your next meeting or conference.